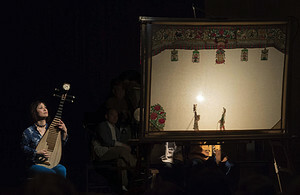 Wu Man and the Huayin Shadow Puppet Band Review: China’s Musical Time Machine The pipa player is on a mission to expose Westerners to quickly disappearing strands of traditional Chinese music. The rural ensemble on tour with her provides a vivid example. Though China looms larger than ever in the news, Americans remain largely ignorant of its musical culture. And while opportunities to broaden our perspective occasionally occur—Carnegie Hall made China the focus of a major festival in 2009 and Lincoln Center has presented various Chinese troupes over the years—rare are visits by ensembles from China’s heartland, where peasant traditions go back generations, if not centuries. Enter the pipa virtuoso Wu Man, arguably the pre-eminent ambassador for traditional Chinese music in the U.S. Born in Hangzhou, China, and educated in Beijing, Ms. Wu, whose four-stringed, fretted instrument resembles the Western lute, relocated to the U.S. in 1990 and has since crossed all manner of cultural boundaries, performing regularly with Yo-Yo Ma’s Silk Road Ensemble and the Kronos Quartet. Yet even as Ms. Wu found ways of integrating her instrument into broader musical currents, she lamented the decline, perhaps even extinction, of many regional musical forms in her homeland. And though she may not be able to prevent their ultimate demise, she seems determined to expose Westerners to these quickly disappearing strands of Chinese heritage. Hence her present 12-city U.S. tour with the Huayin Shadow Puppet Band, with performances in Washington this Friday and New York on Saturday, as well as in Cleveland on March 21 and Boston on March 25. The tour is not the Huayin band’s first visit to the U.S. That was in 2009, when Ms. Wu brought them to Carnegie Hall, but this is the group’s first time back since and, given the ages of its members, possibly the last in its present incarnation. The band of eight hails from northeastern China and was for centuries, through 11 generations, known as the Zhang Family Band, because its members (always male) were exclusively from the Zhang clan. A shortage of eligible replacements necessitated a more liberal initiation policy, but four in the current lineup still carry the original surname. Like other rural bands, its prime function has been to enhance festivals and rituals, including weddings and funerals. At the Huntington Library here on March 5, the tour’s third stop, Ms. Wu served multiple roles—as emcee, explicator, translator and, most important of all, guest soloist. The intermissionless show began with two solos by her, one each in lyrical and martial styles. Ms. Wu is a wonder on the pipa, whose history dates back some 2,000 years. She conjures rich soundscapes through tremolo, banding notes and preternaturally precise plucking. Her instrument, a particularly gorgeous model from the 1950s that she inherited from her teacher, often sounds like a banjo, but such is her aptitude that in an instant it can segue into sounding like a wood block being struck. In a way, her assured, refined playing served as something of a bait-and-switch when the Shadow Puppet Band finally appeared. In fact, the term “puppet band” itself is somewhat misleading in that only two of the program’s 12 numbers included puppets. And though the shadow puppetry was delightful (if not always narratively comprehensible to non-native speakers), it was rendered without magnification and was thus difficult to see in detail. Not that it really mattered, for the vivacious members of the band, their ages notwithstanding, provided ample entertainment. Roused by their long-serving leader, Zhang Ximin, whose guttural, high-pitched utterances were more akin to 20th-century German Sprechstimmethan to our normal notions of singing, the band members gleefully shouted and banged their way on primitive instruments through numbers whose themes varied from tales of military glory to ruminations on peasant life to cautionary tales about human ambition. Attired in rural garb, the musicians performed on instruments that seemed at once vaguely familiar and utterly foreign. Zhang Ximin’s yueqin, for example, looked like a banjo designed by Georges Braque. His cousin Zhang Quansi sometimes played an erhu, the most rudimentary fiddle one can imagine. But he had a far more prominent role striking a bench—essentially a sawhorse—with a grooved woodblock, which he did with extraordinary gusto throughout the show. A nephew, Zhang Xinmin, played a natural (that is, valveless) trumpet, adding welcome texture and further volume to the sound, which despite being unamplified was generally very loud. In the evening’s final number, “The General’s Orders Stir the Mountains and Rivers,” following further solos on the pipa, the band returned to the stage running and screeching like fraternity brothers attempting to impress a demure coed (in this case, the ever-composed Ms. Wu). They found common cause in this final up-tempo number, with Ms. Wu very much holding her own against larger, less disciplined forces. It would be easy to dismiss all this as a form of cultural tourism. But if Ms. Wu has her way, these shows are merely the first in a series bringing similarly unusual, and imperiled, Chinese musical forms to this country. If nothing else, such performances represent a chance to glimpse a bit of history before it disappears entirely.